Bangalore: As Delhi goes to the polls on Saturday, authorities in the national capital are enforcing a strict 48-hour closure of liquor shops, partly to thwart attempts by candidates to buy ballots with booze, a potent election-time blandishment for poor voters across the country. 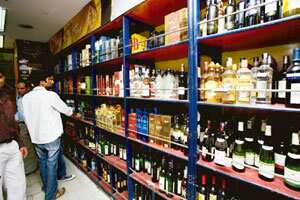 Closure of liquor shops is routine during state or national elections. It is also a time when there is a spurt in bootlegging in the country, where politicians using liquor to buy votes is a common phenomenon. The Election Commission has been tightening oversight to ensure that candidates don’t hand out liquor and other blandishments to voters. Extra vigilance to ensure a sober polling day seems to have paid off. The Delhi excise department’s haul of some 13,420 bottles of illegal, or duty-evaded liquor, in the 10 days to 25 November marked a 350% increase over the corresponding period last year when there was no election. “Election is one of the reasons (for the increase in smuggling cases), but the main reason (for the seizures) is that we have started a special drive and deployed all our staff for this," said Sanjeev Ahuja, deputy commissioner of the Delhi excise department, in a telephone interview. Still, Ahuja said liquor sales in the Capital have slowed from October, a month of festivals, including Diwali. The average sales of Indian made foreign liquor (IMFL)—as locally made spirits such as whisky, rum and brandy are classified—in Delhi is about two million cases a month. Each case holds 9 litres in 12 bottles. The Delhi polls dovetail with elections in Mizoram (29 November) and Rajasthan (4 December). Voters in Jammu and Kashmir, where two phases of polling were held on 17 November and 23 November, will troop out for the two remaining phases on 30 November and 7 December. Polling has been completed in Chhattisgarh and Madhya Pradesh. In Madhya Pradesh, where the election concluded on Thursday, the state election department monitored the movement of alcohol out of liquor factories and ensured prohibition in neighbouring states as well. “We made various seizures all over the state. The general trend is that distribution of liquor during this election has been very minimal compared to what it used to be earlier," said J.S. Mathur, chief electoral officer of Madhya Pradesh. “That’s also due to the strong stance taken by the Election Commission." Says Trilochan Sastry, a faculty member at the Indian Institute of Management, Bangalore, who heads a non-governmental organization, the Association for Democratic Reforms: “Liquor is part of the whole strategy to buy votes. Those (candidates) who spend (large sums on blandishments) will not work for public welfare. We are trying to create ground pressure from the people’s side." The forum runs campaigns to inform voters about the incomes and criminal backgrounds, if any, of the election candidates. In Delhi and neighbouring states, the authorities have been demanding identity proof from those buying more than 4 litres of IMFL although there is no way they can say for sure that the spirits are meant to woo voters. “One would not know that because they give reasons like weddings. But we will still remain suspicious," said Delhi’s chief electoral officer Satbir Silas Bedi. The May state elections in Karnataka, where police confiscated illegal liquor worth Rs2 crore, saw a spurt in manufacture of hooch, a country liquor, that led to the death of at least 150 people in Bangalore and Kolar and the bordering Krishnagiri district of Tamil Nadu. In Tamil Nadu, the Pattali Makkal Katchi, an ally of the ruling Congress-led United Progressive Alliance, or UPA, has called for prohibition to be enforced in the state, and even in the country. “All over India most of the men are addicted to alcohol," said party chief S. Ramadoss, whose son Anbumani Ramadoss is Union health minister. “This menace should be contained." Alcohol is among the biggest revenue earners for most states, and rules governing alcohol and its pricing vary. Monitoring the movement of alcohol is a big concern for enforcement agencies tasked with preventing its smuggling. “Haryana and Chandigarh have lower excise rates. Perhaps that’s the reason liquor is being smuggled into Delhi and Rajasthan," said Sunil Mathur, director for enforcement in Rajasthan’s excise department. According to him, the department has seized about 635,577 bottles of IMFL being smuggled into the state between April and October. India consumes some 190 million cases of IMFL annually and the unorganised country liquor market is estimated to be around 200 million cases. “The unaccounted (liquor) market in India is among the highest in the world," said Johnson J. Edayaranmula, a spokesman for Indian Alcohol Policy Alliance, a Delhi-based non-government organization.